This is an updated version of a TorahBytes message I wrote a few year ago. In Jewish tradition, Hanukkah is referred to as a minor festival, since it was not established through Moses. But this is not a reflection of its importance. For without the events commemorated by this popular celebration, the world would be a very different place. In the mid-2nd century before Yeshua’s coming, the plan and purposes of God almost came to an end. The assimilation forces under the rule of the Hellenistic Seleucid emperor Antiochus Epiphanes were being very effective among the Jews in Israel. They, along with the ongoing presence of God’s truth on Earth, may have been wiped out had not God intervened through the small band of faithful Israelites known as the Maccabees. That God may have preserved his people and his plan by some other means is most likely. Yet, it is instructional to look at just how crucial these events were and what was at stake. God chose the people of Israel to make himself known to the nations. That was why God called Abraham in the first place. His plan was never concerned about Israel alone, but about the world. Precisely how that was going to work out was not clear in the Hebrew Bible. A common notion derived from the prophets was that as God brought restoration to Israel, the nations too would benefit as a spillover effect. What was not anticipated was that people from all nations would have the opportunity to personally and intimately come to know the God of Israel too. While this does not get clearly spelled out until after Yeshua’s coming, there are prophetic portions that do suggest that non-Jews would one day have a personal relationship with God. One of those portions is read as a special reading on the Sabbath that occurs during the eight days of Hanukkah. Zechariah was a prophet a few centuries before the first Hanukkah, when the Jewish people were in the early stages of rebuilding the nation after returning from the exile to Babylon. It was a difficult and discouraging time. But God through Zechariah sought to encourage the people by speaking of an unknown future time of great restoration when God himself would live among his people. When this happens not only will the Jewish people be restored to God, but members of other nations would join themselves to the God of Israel and become his people too. The inclusion of other nations to be part of the people of God is the fulfillment of God’s promise of blessing through Abraham and his descendants to the world. But note how the inclusion of Gentiles is connected to Israel’s restoration. God’s establishment of and faithfulness to the nation of Israel is a necessary component of God’s rescue plan for the world. Israel was not simply the warm up to God’s greater purposes among the nations. Israel is God’s plan through which salvation comes to all. That is why God’s preservation of Israel commemorated at Hanukkah is a cause for celebration not just for Jewish people, but for everyone. The whole world should honor the Maccabees for resisting being absorbed into the Greek worldview of their day, so that through the Messiah Yeshua people of every tribe, nation, and language could be an instrument of God’s light today. This past spring, popular megaplex church leader, Andy Stanley, presented a three-part sermon series, entitled “Aftermath,” described on his church’s website as: “Jesus’ resurrection launched a series of events that introduced the world to his new covenant and new hope. But old ways don’t easily give way. Not then. Not now” (http://northpoint.org/messages/aftermath/). In part three of the series Stanley claims that the early Jewish believers called for a sharp disconnect between the fledgling New Covenant community and the Hebrew Scriptures. Much can be said to critique Stanley’s approach and many of his specific statements, but what I wish to demonstrate here is that his attempt to undermine the ongoing authority of the whole Bible is not new. From the ancient heretic Marcion, who claimed the New Testament “god” was different from the Old Testament “god” to the Nazi-inspired “Institute for the Study and Eradication of Jewish Influence on German Religious Life” to Andy Stanley’s attempt to make Christianity “irresistible,” there have been all sorts of intentional schemes to tear the Hebrew Scriptures away from Christianity. While many believers immediately reject such anti-biblical ideologies, you may be surprised to discover how common negative views of the Old Testament really are. “Merciful and gracious… but who will by no means clear the guilty.” God is both merciful and just. From Genesis to Revelation, God is always and forever consistent with himself. We break the connection between Old and New Testaments every time we create illegitimate contrasts between them. For example, when Jesus’s words in the Sermon on the Mount, “You have heard that it was said to those of old” (Matthew 5:21, 27, 33, 38, 43), are taken to mean “You have heard that it was written to those of old,” that assumes that Jesus is contradicting, not interpreting, Moses. Is not twisting “Do not think that I have come to abolish the Law (Torah) or the Prophets” (Matthew 5:17) into abolishing the Torah and the Prophets an attempt to unhitch the New from the Old? And this is in spite of what Jesus says in the second half of that same verse: “I have not come to abolish them but to fulfill them”? “Fulfill” here cannot mean “to put an end to.” Rather, it indicates Jesus’s intention to demonstrate bringing the Hebrew Scriptures to their fulness by truly living them out and to equip others to do the same. This would be a good place for me to clarify that there are indeed contrasts between the Testaments. How Scripture is to be understood and applied must be in light of our living in the Messianic age – these days of the New Covenant since Jesus’s coming. The Levitical sacrificial system is no longer in force nor is the Israelite theocracy, even though the sacrifice of the Messiah and his kingly role are central. The homogeneous makeup of Israel as the people of God has been extended to the ingrafting of the nations without the need of initiation rites. Yet this reconstitution of God’s covenant relationship to his people should not lead us to assume a casting away of the foundational function of Moses and the rest of the Hebrew Scriptures, not to mention the unconditional, eternal promises to Israel through Abraham, Isaac, and Jacob. But doesn’t John chapter one, verse seventeen, for example, distance the New Testament from the Old? It reads: “For the law was given by Moses, but grace and truth came by Jesus Christ” This wording is found in the King James Bible and many other, though not all, popular English versions. But the “but” isn’t in the Greek. It was added in these translations, because the translators deemed it to be implied. The problem is that the implication may be more due to prejudice towards the Hebrew Scriptures than sound scholarship. The addition of “but” in this verse fuels the law vs. grace false dichotomy. Christians have often taken Paul’s insistence on faith being the sole basis of God’s acceptance as necessarily devaluing the books of Moses and the rest of the Hebrew Scriptures. Paul was certainly concerned about an aspect of rabbinic teaching that regarded the embracing of Torah, not faith, as the sign of genuine covenant relationship with God. According to this traditional view, only born Jews and converts to Judaism can truly fulfill that role. The New Covenant opens the door to non-Jews to find full acceptance by God outside of the community of Israel. The term “law” in such contexts is a reference to the rabbinic system they erroneously assumed to be based on Torah, rather than the contents of the Books of Moses themselves. Grace isn’t an exclusively New Covenant concept. Paul demonstrates that right relationship with God has always been established on the basis of grace through faith. The term, “grace,” is to be understood as God’s enabling power freely given to those who trust him, as reflected through all those who have been faithful to him from Abel onwards. The contrast between Moses and Jesus in John 1:17 is one of degree and application, hearkening back to Jesus’s words from Matthew about “fulfillment.” Grace doesn’t nullify the essential role of the Hebrew Scriptures. On the contrary, we can’t fully understand grace apart from it. Through Jesus the satanic oppression of sin is broken, thus enabling anyone anywhere to know the God of Israel and be filled with his Spirit. What was experienced by a few in a relatively small region of the world is now accessible to all everywhere through the New Covenant. Another way some disconnect the Hebrew Scriptures from the New Testament is even though they passionately value God’s Law, they do so only in a negative sense by focusing exclusively on how it demonstrates our need for God. Doesn’t Paul make a case for this? The Torah’s function in illuminating the human sin problem is core, but is that it? Is this all that’s behind these words from Paul to Timothy? All Scripture is breathed out by God and profitable for teaching, for reproof, for correction, and for training in righteousness, that the man of God may be complete, equipped for every good work (2 Timothy 3:16-17). Are we made “complete” (meaning “mature”) and “equipped for every good work” by the Hebrew Scriptures showing us nothing but how sinful we are? You might think that’s why Paul told the Corinthians (see 1 Corinthians 10:1-13) that Israel’s failure in the wilderness should act as an example – a bad example – to them. If so, you may have negative prejudicial glasses on. Israel did act badly. But how do we know this was ungodly behavior except that the Books of Moses plus commentary from the Psalms inform us of such? Paul’s goal for the Corinthians wasn’t only that they wouldn’t follow the bad example. It was that they would act in the desired godly manner as revealed in these Torah stories. The effectiveness of these examples is that they reflect the reality of life and God’s will regardless of the time period. This is what Paul is talking about when he reminds Timothy that “all Scripture” is essential for godly living – “all Scripture” meaning, as it did in the entire early church, the Hebrew Bible, since there was no New Testament yet. Not only did Paul regard the Hebrew Scriptures as effective, they were also sufficient. This may be difficult for many Christians to accept, due to how much they are ignored, with or without the negative sentiments I have outlined. This in no way downplays the inspiration and authority of the New Testament. Rather it emphasizes how foundational and effective the Hebrew Scriptures were (and should still be) for believers. Then there’s the title itself, “the Old Testament.” You likely have never thought about how this way of referring to it devalues it. First, Old rather than New automatically sounds negative to modern ears as in “Tired of the same Old Testament? Try the new and improved one!” Of course, that might be due to we moderns’ overly positive take on progress. Be that as it may, it doesn’t accurately describe this sacred collection. It’s misleading, in fact. While the Old Covenant (“testament” being another word for “covenant”) given through Moses at Mt. 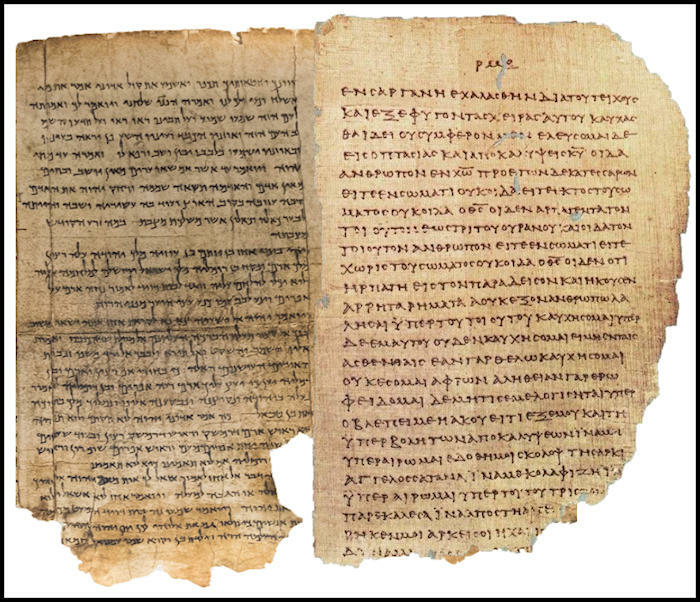 Sinai plays a central role in the Hebrew Scriptures, God’s revelation of truth in these writings isn’t limited to the covenantal arrangement itself. Finally, contrary to popular misconception, the New Testament doesn’t stand on its own. This is not to say that it can’t or should never be read on its own. It’s that it understands itself as being based on the Hebrew Scriptures. Not only is it filled with hundreds of direct quotes from, and allusions to, the older writings, the concepts of God, righteousness, sin, salvation, redemption, forgiveness, Messiah, the Holy Spirit, and on and on, are all deeply rooted in the Hebrew Scriptures. To read the New Testament apart from its scriptural context is to leave it open to great abuse and manipulation. To unhitch the Hebrew Scriptures from our faith is to cut ourselves loose from God himself.